A number of interesting plant galls look so much like fungal structures that for years they were misidentified as a fungal plant disease. Such is the case with the goldenrod leaf galls associated with the midge fly, Asteromyia carbonifera. The galls appear as white, circular to elongate slightly raised structures on both the upper and lower leaf surfaces. As the galls mature, they develop a faint black ring near the outer edge making the galls look target-like. The leaf galls were originally described as being the result of infections by the fungus Rhytisma spp. However, as with many things in nature, there is more to this story than meets the eye. In fact, the galls do house a fungus, Botryosphaeria dothidea (previously identified as Sclerotium asteris) as well as the midge fly. However, the midge fly and the fungus have an obligate mutualistic symbiotic relationship meaning that the two live for the mutual benefit of one another and the relationship is so strong that without the fungus, the flies could not develop on goldenrod, and vice versa. Indeed, the female flies carry spores of the fungus in specialized structures (mycangium) in their terminal abdominal segment. When the flies insert eggs into the goldenrod leaf tissue, they also inoculate the plant with the fungus. Most gall-making midge flies that belong to the family Cecidomyiidae directly orchestrate the growth of their associated galls. However, it appears that the growth of the galls on goldenrod is directed by the fungus rather than the midge fly. And, this is not the only "service" provided by the fungus. The fungal mycelium surrounds the midge fly larvae (maggots) and the maggots feast on the fungal tissue rather than plant tissue. Eventually, a layer of the fungal mycelium differentiates to form a black, tough, dense vegetative structure called a stroma. The black, carbon-like stroma may be revealed by carefully peeling away the surface of the galls on the lower leaf surface. The stroma adds rigidity to the gall structure, and it also helps to protect the midge maggots and pupae from the depredations of the parasitoid wasp Torymus capitae. The wasp probes the gall with its ovipositor seeking to lay an egg in the immature flies; however, their ovipositors cannot easily penetrate the fungal stroma. The midge-fungus is a symbiotic relationship that keeps on giving; the midge fly has multiple generations per season with each new generation being entirely dependent upon the fungus, and vice versa. Although the galls were originally misidentified as a fungal plant disease, there is indeed a fungus amongus ... which is a very good thing for the midge fly! 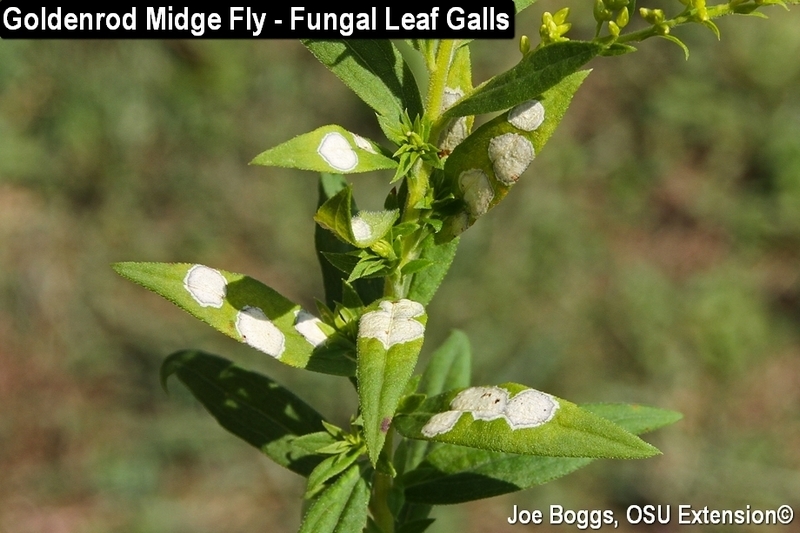 The midge fly - fungal galls cause little harm to their goldenrod host plants. Indeed, some would say they provide added value because of their fascinating story.